Instead, we went antiquing in New Bedford on Sunday, after Mr S spent Saturday clearing brush at Minute Man National Historic Park. New Bedford was a nice change from the places we usually go in Rhode Island, and I always enjoy looking in Massachusetts, because objects there are typically free of Rhode Island connections, which means I can actually make encumbrance-free purchases. I don’t know how encumbrance-free this purchase was…for now we are encumbered with a large hard paste porcelain tureen decorated with cranes and a federal eagle. The platter it sits on may not be its original platter, but do I care? No. Look at that fantastic, crazy thing. The face the Young Mr made when this was unwrapped in front of him was priceless, but he has long questioned my sanity; now he will question my aesthetics. 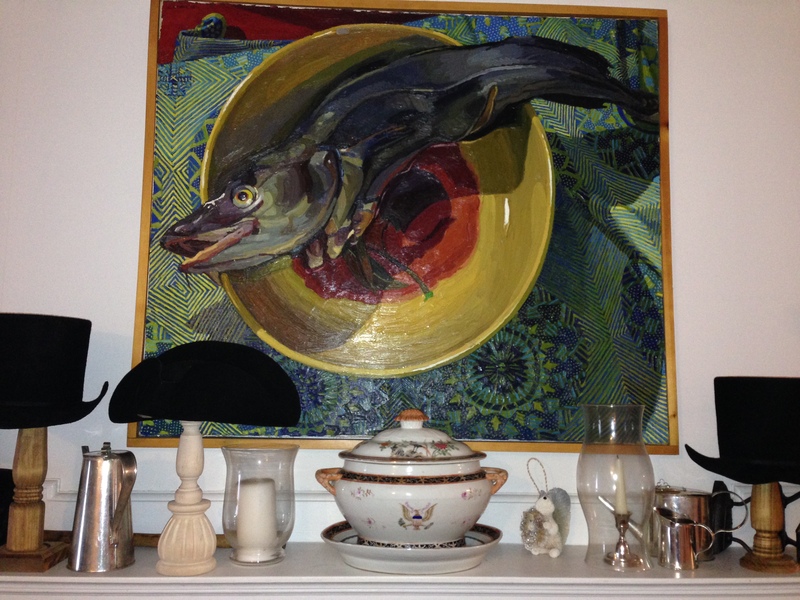 It sits in pride of place on our mantle now, and as far as I can tell, it’s typical of the shape of tureens made for the American market ca. 1790-1810. I’ve not seen the cranes before, and I still haven’t found this pattern in a museum or auction house, though Winterthur’s tureen collection is pretty amazing. If the thing is real (and it looks and feels like the real ones at work), its voyage has been incredible: from China to a port in Massachusetts, down through time to a shelf in an old mill building, to my mantle. Think of the person who ordered this– and the set it was likely part of– by letter, and then waited for months for the goods to arrive. Some sets were as large as 250 pieces, custom-monogrammed at the factory, and then packed into barrels and crates lined with straw and loaded onto ships bound back to the East Coast. I’d love to know this piece’s story, but even without a provenance, the object itself is pretty astonishing, and fits into our already eclectic china (and yes, mantle business). Now, for a soup party! Congratulations on a special anniversary as well as an appropriate way to mark it. 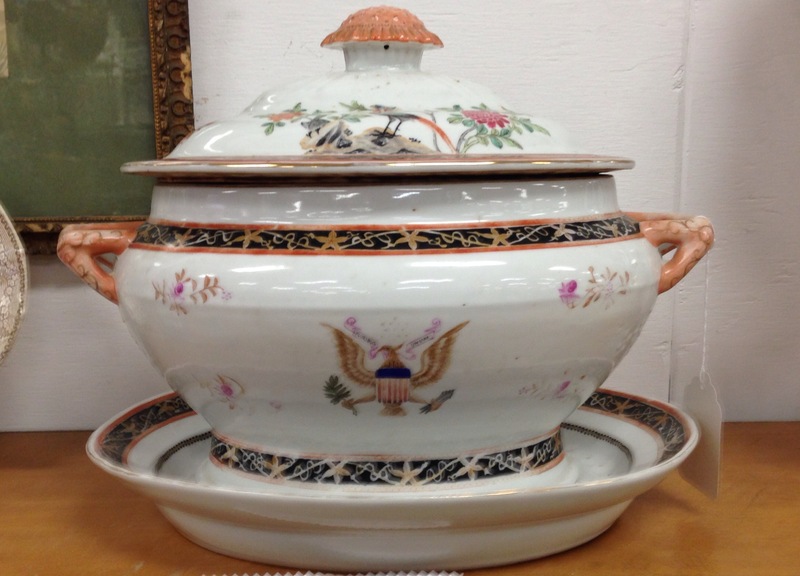 Fascinating tureen. I’ve not seen one with patterning like it before, either. The flowers or starfish and vines or little lines in the black banding are unusual.